Allison Marshall - B.Mus., A.R.C.T. Allison was attracted to the Piano as a toddler. She began lessons at age five, and became a proficient accompanist and solo performer by seventeen. At twenty-one she moved to Victoria, to continue studying music while working full time as an R.N. In 1965 Allison received her A.R.C.T. for Performance and two years later began studying under Dr. Robin Wood at the Victoria Conservatory of Music and later at the University of Victoria. She also taught part-time at the Conservatory between 1968 and 1973. Allison won awards in senior Piano Competitions, and in 1973 received a Bachelor of Music in Performance from the University. She was also the accompanist for James Hunter's senior Cello students, during these years. In 1978, music called again in the form of a teaching position at Malaspina College, where she instructed classes in Music Rudiments, and Harmony. At this time, she took a course in the Kodaly Methodology of music instruction for children and began experimenting with ideas, which she had been formulating for some years, on a new way to teach beginning Piano Students. To further develop her ideas, Allison enrolled as a Graduate student in Music Education at the University of Victoria to study Child Development, and Curriculum Development and Implementation. The very successful result was the creation of "Childhood Horizons to Keyboard Musicianship" otherwise known as "Folksongs for Little Folks". Upon completing these courses, Allison set up private practice as a Music Teacher. Between 1980 and 1985 she also taught at the Victoria Conservatory of Music. Over the years, her many students have benefited greatly from her music program, some going on to successful careers in performance. She is presently teaching at home in Metchosin, and in Langford at the Westshore Music Academy. The Harp had been a fascination for many years, and in 2000 the opportunity to learn to play, presented itself. 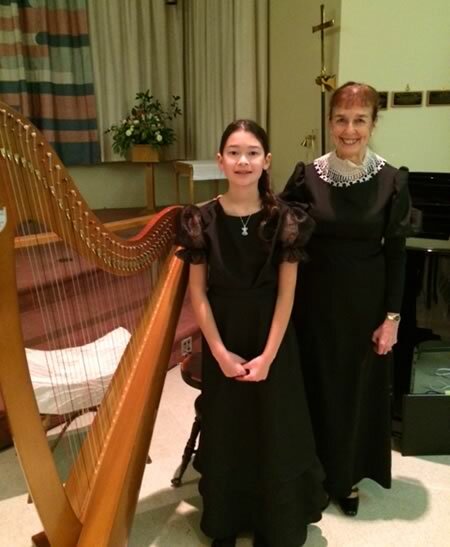 In 2005, she began to study with Kathryn Ely, retired harpist for the Victoria Symphony and a year later, Kathryn suggested that with good technique, and years of teaching piano, Allison should teach Harp. She successfully adapted her piano program to harp and since 2007 has been instructing students in that instrument as well. She is also presently enjoying study with the highly acclaimed Harpist, Josh Layne. As a five-year-old beginning piano student I was overwhelmed with tedious lessons full of excessive detail. Years later as a novice teacher, I became determined to present young students with a more engaging child-centered introduction to music. My program 'Childhood Horizons to Keyboard Musicianship' is the result. This is a correlated 33-week instructional piano program designed for young beginning pianists. Learning is experienced through various activities and then applied to the piano. Materials used include hand puppets, felt, cardboard and wooden representations. The program is based on the Kodaly philosophy of music education, and the child development and learning theories of Piaget and Bruner. Folksongs for Little Folks is the student book of accumulative song sheets, theory sheets and crossword puzzles.